February 2013 - Midwest Sports Publishing Network, Inc.
Amber will be taking out groups at each location based on reservations. She will have a limited number of 2014 Mountain sleds for taking out small groups for a quality ride on the new product. To reserve a space please contact: Amber Holt at Backcountry Basics (backountrybasics.com), e-mail backcountrybasics@yahoo.com, or phone 509-733-6464. For more information about Arctic Cat and its products, visit www.arcticcat.com. Aurora, Minn. (February 25, 2013) For the second straight weekend in AMSOIL Championship Snocross competition, Tim Tremblay raced to finishes of third and second place to claim sole possession of second in the title chase. Tremblay turned in the performance at the U.S. Air Force National in Salamanca, New York as the tour made its first-ever stop in this region of the empire state. Tremblay has a track record of getting faster and riding stronger over the course of a long, grinding season when other competitors start to fade. With two weekendsof racing remaining on the schedule, Tremblay and the team are happy with the improvements we continue to make but still eager to get the first win of the season for the number 11 Ski-Doo. Robbie Malinoski, who has been nursing a tender knee following an incident several weeks back at the Eagle River World Championships, was unable to start Saturday’s event and is having an MRI performed this week to determine the best course of recovery. Several members of the U.S. Air Force were on hand in New York to interact with the team, perform a DEP swear-in and take part in guest rides on the national track. Up next are ACS rounds 13 and 14 from Fargo, North Dakota on March 8-9. 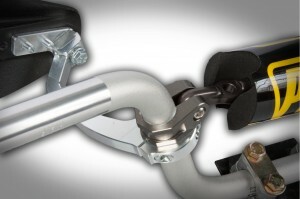 Rox Speed FX has released a Pro Taper Bar Adapter that allows you to mount their popular Flex-Tec series of handguards onto your Polaris Pro Taper handlebar. The Rox Flex-Tec Handguards have been in high demand with trail riders because of their ﬂexible backbone, which allows the guard to twist and ﬂex in the event of a rollover while still providing protection from frontal impacts. Since releasing the Flex-Tec Handguard, Rox has been flooded with customer requests asking for the ability to mount the Flex-Tec Handguards on Polaris Pro Taper handlebars. The Rox Pro Taper Bar Adapter is available immediately by calling 218-326-1794 and will be available beginning March 1 at www.RoxSpeedFx.com. Thief River Falls, Minn. (Feb. 27, 2013) – Sara Haines is a contributing correspondent for NBC News’ TODAY. Haines appears daily on the fourth hour of TODAY alongside hosts Kathie Lee Gifford and Hoda Kotb, covering fan updates and interacting with viewers via Facebook, Twitter and KLGandHoda.com. 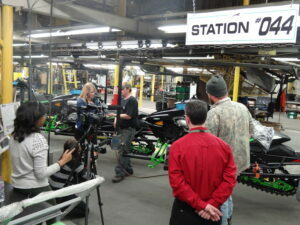 Recently, Haines visited the Arctic Cat Factory in Thief River Falls, Minn. to film a segment that will tentatively air on March 5th at 11am CT. (Check your local listings) Sara rolled up her sleeves and learned how to build a 2014 ZR 6000 El Tigre snowmobile on the assembly line, where she loaded the robotic self-piercing rivet cells, installed shocks, hoods and even windshields. After her visit to the Arctic Cat Factory, Sara took a trip to Fertile, Minn. to spend the afternoon at the Christian Bros. Race Shop with the goal of learning how to ride with Team Arctic racer, and current ISOC Snocross points leader, Tucker Hibbert. Sara started her snocross learning experience aboard Evan Christian’s Arctic Cat Sno Pro 500, with direction from Tucker on how to use the throttle and brakes, lean in the corners and even how to stand-up while riding on an oval track. She then progressed to the National sized snocross track that the Pro racers use. 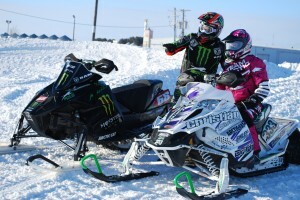 Tucker Hibbert said, “Sara was nervous but is a fast learner, and immediately, she looked comfortable on the Sno Pro 500. In no time, she moved up from the flat oval track, to the actual National-level snocross track. She didn’t want to stop riding and even caught a little air! It was impressive for a first-time rider and her huge smile proved that everyone should try snowmobiling. ST. CLOUD, Minnesota – During the course of a season that includes non-stop testing, travel and 16 rounds of competition, consistency can be one of the most valuable traits a race team can possess. Over the last several weeks, Warnert Racing team riders Emil Ohman and Travis Muller have been as steady as any on the circuit, finishing in the top five again last weekend in Salamanca, New York gaining valuable spots in the championship chase. Emil Ohman started Friday’s main event in fifth place and was able to work his NSK/Ski-Doo as high as third in the middle stages of the 24 lap main event before slipping back to finish fifth overall. On Saturday, Ohman improved his qualifying efforts with 3-2 finishes and then made a strong charge in the main event where he raced from ninth place at the start to fourth at the finish. The track on Saturday became extremely rough and Ohman’s fitness really shined in the final three laps where he advanced three positions. Ohman has now climbed to fifth in the Pro Open standings, which is his highest position this year. 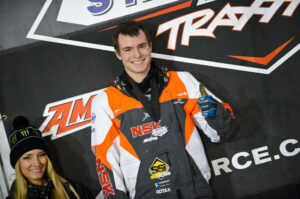 It was an excellent weekend all the way around for NSK/Ski-Doo Pro Lite racer Travis Muller. Muller never qualified outside of the top 4, including one heat race win and two seconds. In Friday’s final, Muller started seventh but used a fast inside line of the first straight to quickly advance to third. On lap nine of the 16 lap main event, he moved into second where he was able to hang on and claim the second step on the podium. On Saturday, Muller was boxed out on the start and had to charge from 12th place. Picking off nearly one rider per lap, Muller made it all the way back to 4th place at the finish, collecting valuable championship points as he now sits third overall in the class and is within reach of the leader with two weekends to go. 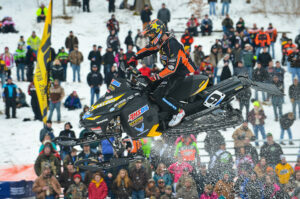 Up next is the RAM Trucks National in Glyndon, Minnesota on March 8-9.